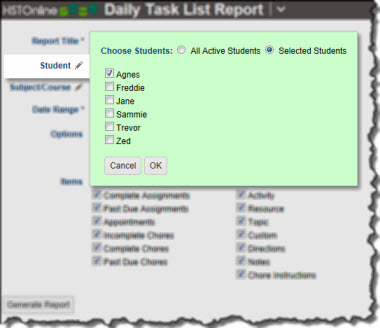 Use the Daily Task List Report to provide your Student with a list of Appointments, Assignments and/or Chores for the date range of your choice. You can choose just Assignments, Appointments or Chores, or any combination of those three item types. 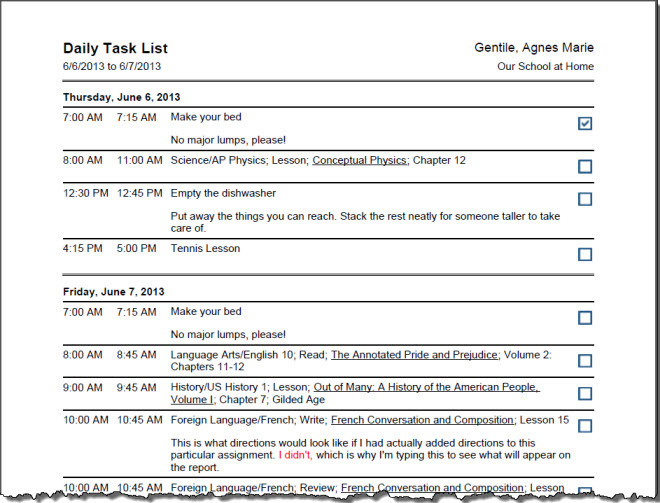 If you choose to include completed assignments or chores, those items are displayed with a checkmark in the 'done' box. You can choose to have your report items grouped by Date (the default) or by Subject/Course, and you can choose which fields you want to include in the report. When a Student user is logged in, 'Incomplete' Assignments or Chores are those which are marked neither Student nor Teacher complete; 'Complete' Assignments or Chores are those which are marked either Student- or Teacher-Complete. When a Teacher/Administrator user is logged in, 'Incomplete' Assignments or Chores are those which are not marked Teacher-Complete; 'Complete' Assignments or Chores are those which are marked Teacher-Complete. The default name for this report is: Daily Task List. You can change the Report Title to anything you like, up to 150 characters. Click or touch the Student field name or the pencil icon to choose the Students to be included in this report. You can choose 'All Active Students' or choose 'Selected Students' and then choose from your list and click or touch 'Ok'. Click or touch the Subject/Course field name or the pencil icon to choose the Subjects/Courses you want to include in the report. 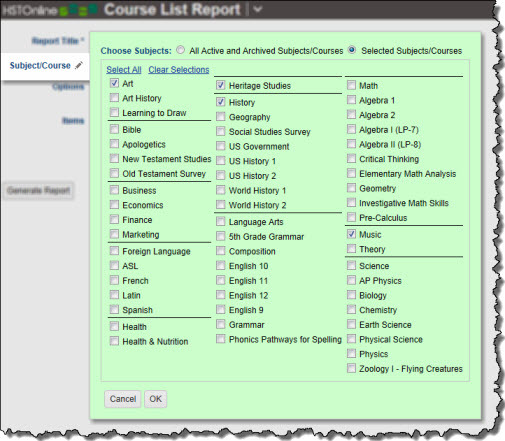 The Subject/Course option window includes all Active and Archived Subjects and Courses for selection. Select a date range for the report. Enter a date using the mm/dd/yyyy format or click or touch the Calendar icon to select a date. 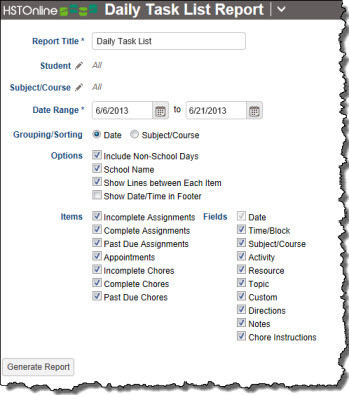 Include Non-School Days: The Daily Task List will only shows those dates within your selected date range which have at least one of your selected items scheduled: Assignments, Appointments, or Chores. When you choose this option, the report will include non-school days in the report if there are Assignments, Appointments or Chores which fall on those days, otherwise, those dates are skipped. School Name: Choose whether to include your School Name in the report header. Show Lines between Each Item: There will be a narrow set of double-lines between each date. Check this option if you also would like to have a line between each item on the list. The sample reports above show the additional lines included and excluded. Show Date/Time in Footer: Choose whether to display the date and time when the Daily Task List report was generated. The date and time will be determined based on your Time Zone settings. Appointments: Any Appointment that falls within the date range. Choose which fields will be displayed for each item in the report. Only fields which you have enabled in Program Options: Optional Fields will be displayed. If you include Directions and/or Notes, the full details in the field for any Assignment in the list will be included in full HTML format; Chore Instructions, if included will be displayed each time the Chore appears in the report, in full HTML format. 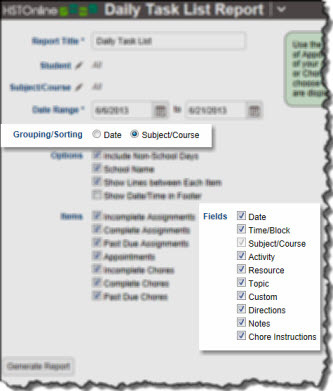 When Grouping/Sorting is set to Date: The Date field must be included as the grouping field. You can choose to include or exclude any of the other fields listed. 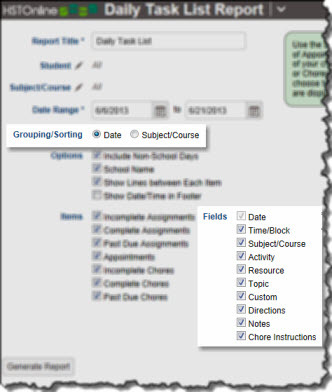 When Grouping/Sorting is set to Subject/Course: The Subject/Course field must be included as the grouping field. You can choose to include or exclude any of the other fields listed. 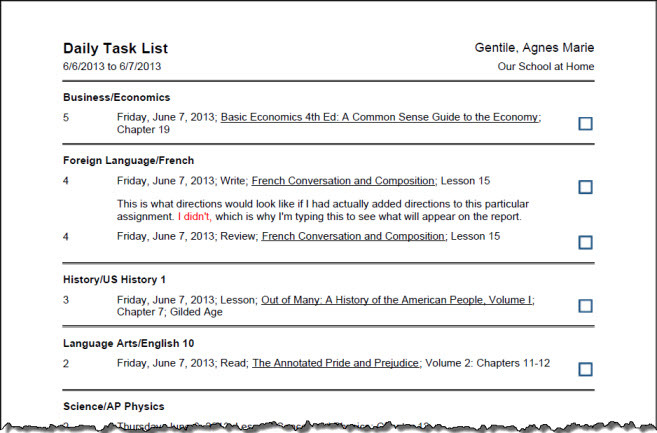 On the HSTOnline menu, click or touch 'Daily Task List' under the 'Reports' section.